Denny Hamlin drove the No. 11 FedEx Express Toyota to a 23rd place finish at Talladega Superspeedway on Sunday. With the result, Hamlin slides down one notch to fourth place in the NASCAR Sprint Cup Series points standings. Brad Keselowski claimed victory on a green-white checkered finish. 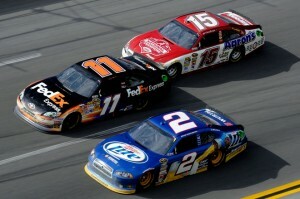 Closely trailing Keselowski was Hamlin’s Joe Gibbs Racing teammate Kyle Busch for second place. Matt Kenseth, Kasey Kahne and Greg Biffle rounded out the top five finishers. Hamlin and Busch’s teammate Joey Logano passed the finish line in 26th place after winning the Nationwide Series race the day before. Perhaps not known as a super speedway racer, Hamlin has three top-five finishes and five top-10 results in 12 previous starts on the 2.66-mile oval coming into the weekend. This includes a career-best third place run in the spring 2008 event. The day began nearly where it ended, with the FedEx team in the 22nd position. The early part of the race did not resemble past Talladega events with only one caution flag in the first 140 laps and very little draft racing. Hamlin worked the No. 11 FedEx car to as high as second place before falling back in the pack due to significant handling issues. By lap 110, Hamlin had lost ground and dropped down a lap to the race leaders. The second caution flag on lap 141 seemed to have ushered in the traditional tight pack racing Talladega fans remember. The caution also benefited the FedEx team. Hamlin was granted the Lucky Dog pass to get back on the lead lap. The subsequent pit stop on lap 145 brought a welcome opportunity to make a wedge adjustment to go along with four tires and fuel. When the green flag waved over the front stretch on lap 149, Hamlin had move up to seventh place. 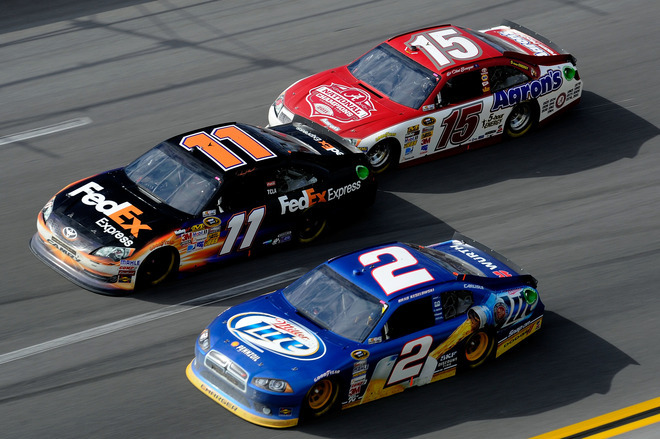 With a better handling car, Hamlin raced to the front of the pack. With a push from Clint Bowyer, Hamlin claimed the race lead on lap 159. With Keselowski pushing Hamlin and Casey Mears pushing Bowyer and 25 laps remaining, an intense battle for the lead commenced. Hamlin moved in and out of first place before the third caution flag of the day slowed the field on lap 175. A quick pit stop under caution gave the No. 11 car four fresh tires and fuel. The green flagged dropped with nine laps remaining and the FedEx team in seventh place. Kurt Busch ran into some trouble two laps later and once again the field went under caution. The green flag returned on lap 184 with Hamlin running in fifth place and aiming for some late-race heroics. The FedEx team’s hopes were quickly dashed, however, when Hamlin got tangled in a wreck just after the restart. The damage sustained proved to be too much to overcome as the FedEx car was forced to visit the pits three times to receive sufficient repairs and allow Hamlin to cross the finish line.